A Certificate of Good Standing is used to substantiate that a company is registered and compliant with it's regulatory requirements. For ONLY £54* we arrange for your certificate of good standing to be issued with the apostille. * If you send the original document signed by a Companies House registrar the fee is £54.00. We can arrange for a copy of the document to be solicitor certified and issued with the apostille for £66.00. Please contact us for advice. What information can be shown on the certificate of good standing? 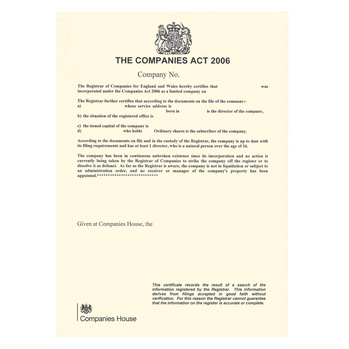 As standard, this document will confirm a company's name, registration number, incorporation date and the good standing statement. It is no longer possible to include details of the shareholders or share capital of a company. How to order an apostille for your certificate of good standing? We can obtain this document for you. If you would like us to obtain the document please let us know the company name, number and the details that should be included. The fee to obtain a certificate of good standing depends on the speed of service required. The expedite 2 day service is £70.00 whereas the 5-7 day service is £35.00. Please contact us for advice.